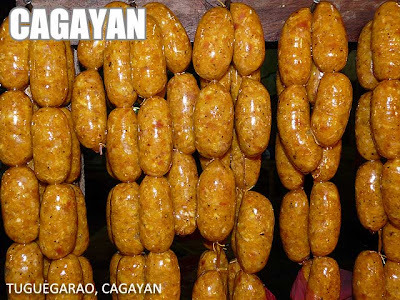 Tuguegarao, Cagayan produces a really popular variety of longganisa. This longganisa would fall under the derecado garlicky (or mabawang) category. The longganisas are said to be very flavorful and stuffed with enough garlic to ward off aswangs. I went around Tuguegarao and saw these longganisas at the Don Domingo Public Market. TUGUEGARAO LONGGANISA FOR SALE! 280php/kl. #39 scout Rallos st. brgy. Laging Handa Q.C. (NEAR DANNY'S GRILL TIMOG) or contact 09267360230 look for migs..
sobra gapa ganansyam pre. nu taga tuguegarao ka kapasiran ka. P170/kg lang longanisa tuguegarao.